VHS-C adapters are aftermarket products that were designed to allow playback of VHS-C cartridges in a standard VCR. Sometimes different tolerances or bad adapter design causes them to act up in certain VCRs. If your VCR is playing all your standard VHS cassettes well, but is having trouble with the VHS-C adapter, then it's quite obvious where the trouble lies. If the tolerances on a VHS-C adapter are slightly different from a standard VHS cassette, the VCR will grumble and grind when it tries to play a tape. 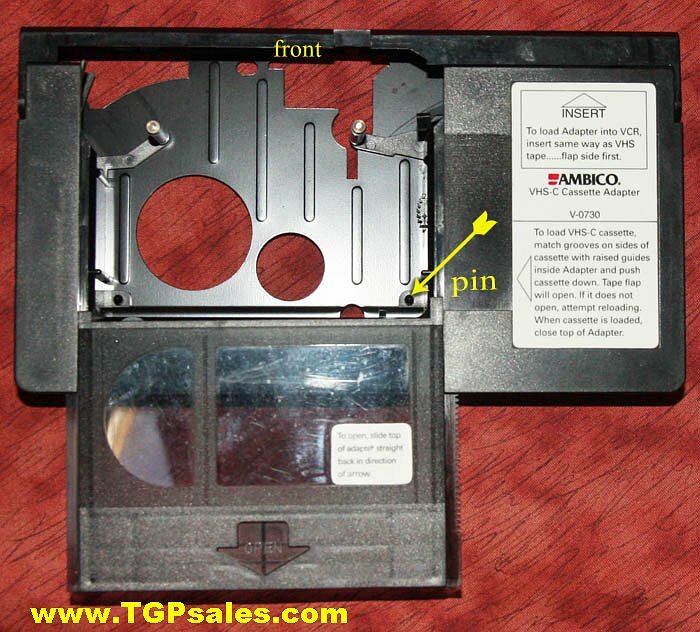 A common problem is that the latch inside the VHS-C cartridge catches and doesn't unlock the tape spool. Sometimes this unlocking latch doesn't line up properly with the pin in the VHS-C adapter. When this happens, the locking gear inside the cassette doesn't loosen fully, and you'll hear a grinding noise, or experience sticking and jerking when the VCR tries to play the tape. A handy tool to use is a jewelers' screwdriver that's about 1/16" dia. Insert this into the hole indicated in the photo above. When the screwdriver is in the hole, the big gear on the side of the VHS-C cassette should turn freely. When the screwdriver is out of the hole you'll hear a grinding noise when you try to turn the big gear. Carefully slide the screwdriver into the hole, thereby moving the white plastic lever to the front of the cassette so the hole is clear. Remove the screwdriver, then repeat the process a few times. When you're done, the white plastic will again partially show in the hole, but the latching mechanism should now be loosened up. Carefully seat the VHS-C cassette into the VHS adapter. Notice the pin that it mates with (see photo below) Make sure this pin isn't bent or damaged. 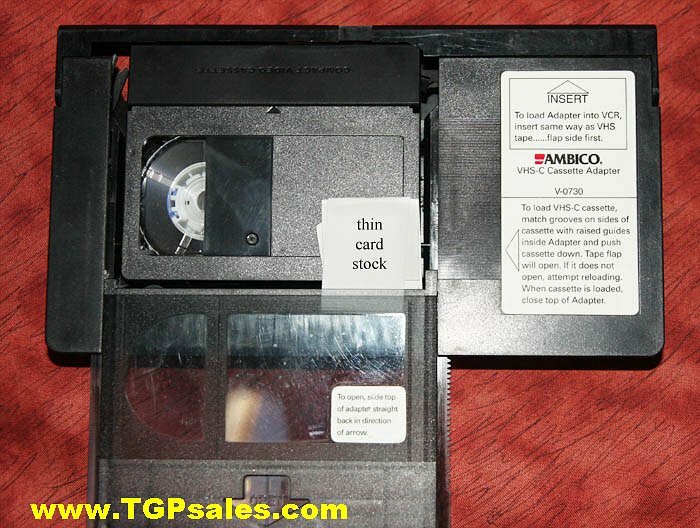 If the grinding noise still continues, try placing a couple of pieces of paper card stock over the corner of the VHS-C cassette. Leave them in position, then close the VHS-C adapter's cover. Sometimes this extra pressure helps the pin make better contact into the hole of the VHS-C cassette. If this doesn't solve the problem, then the final options are to either physically transfer the tape into a standard VHS cassette or use a VHS camcorder to playback the tape. Disclaimer: This article is for informative purposes only. 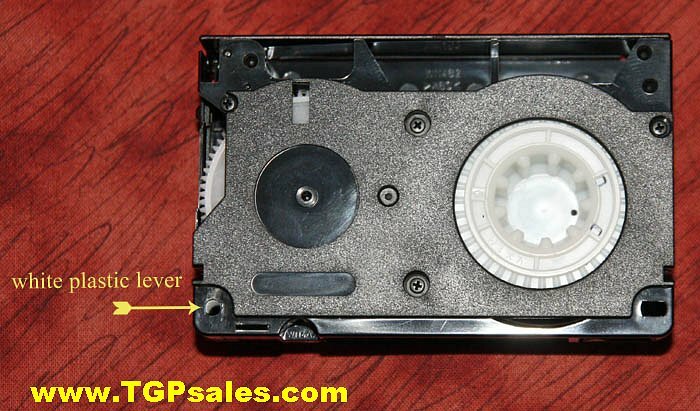 TGrant Photo & TGP Sales is not responsible for any damaged caused to your tape or VCR.